“To the Divine” is a picture shot during the Ganga Aarti celebrated for Dev Diwali at Prayag ghat along the holy waters of the Ganges in Varanasi (Benaras). 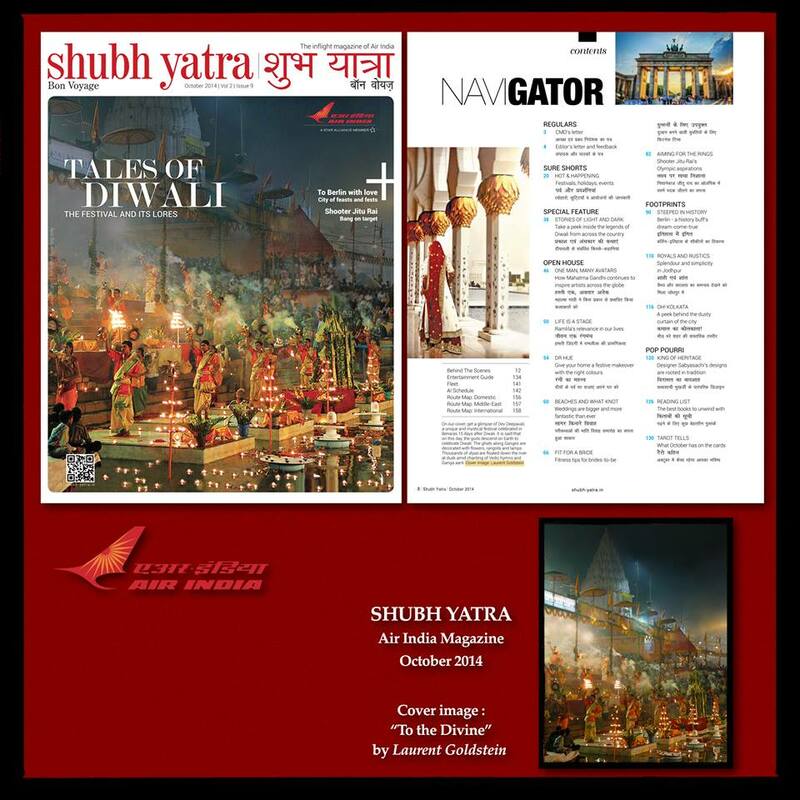 It was selected for the image cover of the October 2014 issue of “SHUBH YATRA”, the inflight magazine of Air India. 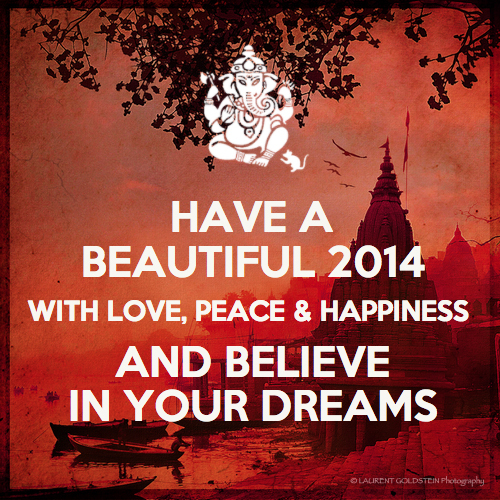 May this year be filled with Love, Peace & Happiness. 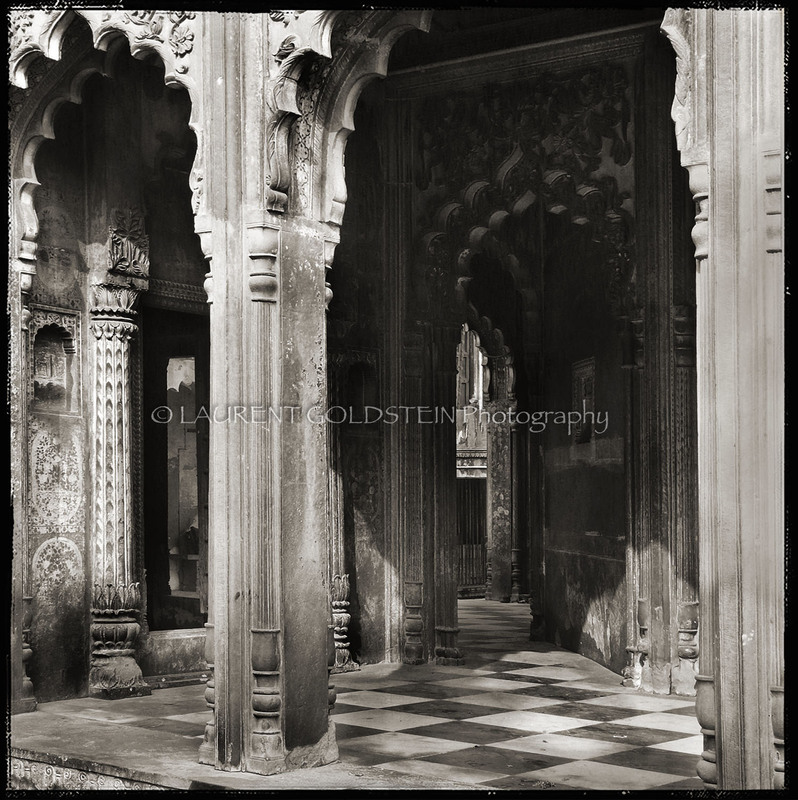 Savitri, a princess, fell in love with a poor man called Satyavan. Narada Muni warned her not to marry Satyavan as he would die at an early age. He even told her when Satyavan was going to die. But Savitri was unmoved and married Satyavan. On the day of Satyavan’s death, she saw that Yama himself had Savitri begging Yama for her hushband lifecome to take him. She begged Yama not to take Satyavan. But Yama said that no one could stop death. For the first boon, Savitri asked for the well-being of her father-in- law. For the second she cleverly asked for a hundred sons. Without thinking, Yama granted her two boons. At this Savitri asked Yama to return her husband because without him, she could not have any sons. Defeated, Yama returned Savitri her husband. 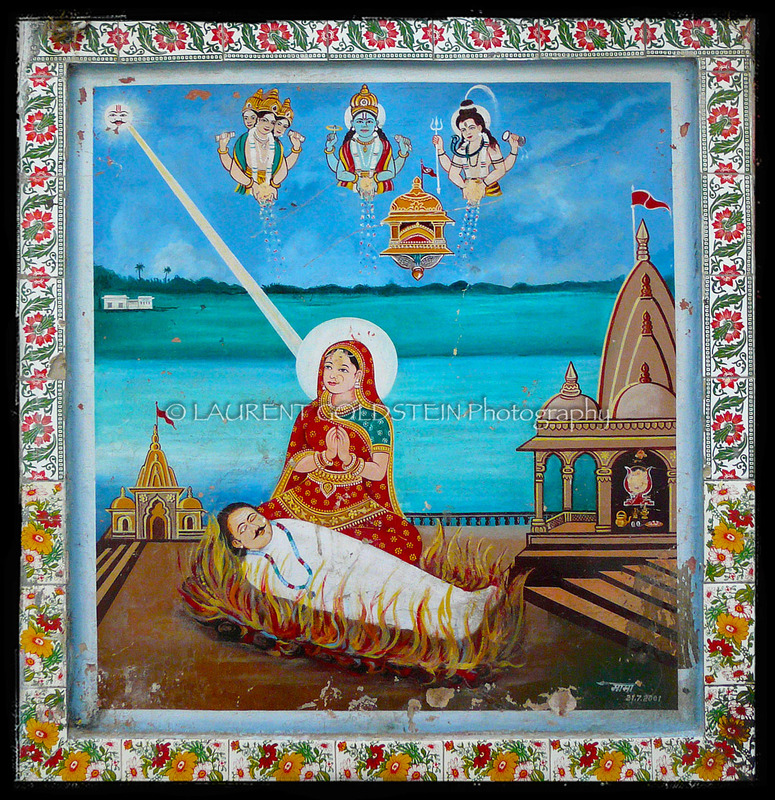 This painting explains the life of Savitri, it is on a wall temple dedicated to Sati in a gali of the old Kashi, somewhere nearby the Chowk in Varanasi (Benaras). The iconic Nicaise is wrapped in a woolen scarf with an Aari embroidery. 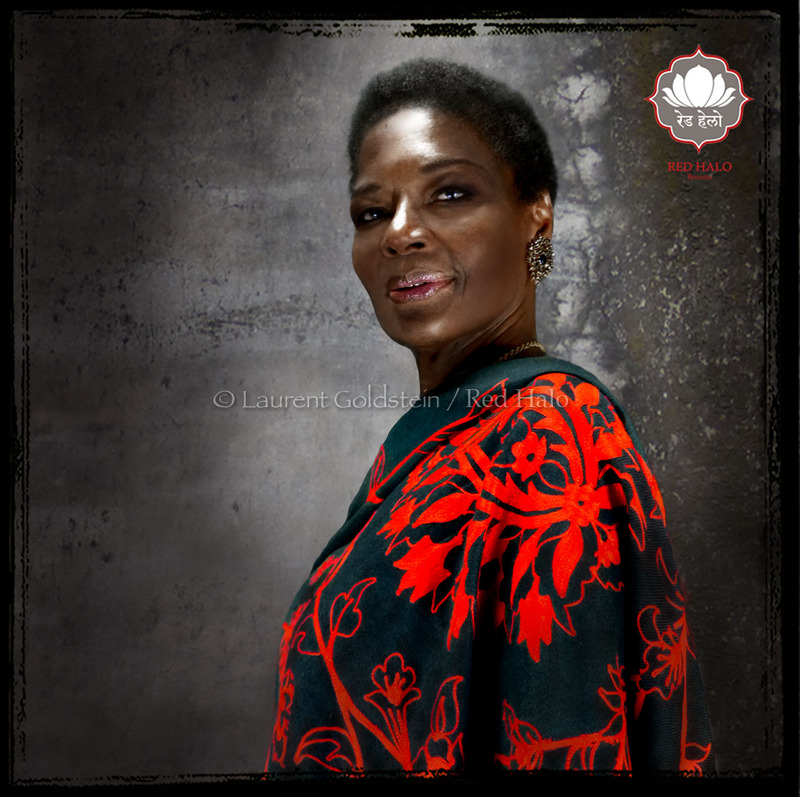 French actress and model Nicaise Jean-Louis has kindly accepted to pose for Red Halo in order to support our social work. During the 70’s Nicaise became one of the first top models with dark skin complexion to work for High Fashion companies, ever since she never stopped working for the most prestigious fashion names, she also performed on stage and played is several well known movies such as “Moonraker” (a Bond girl) or the French movie “Le gendarme et les gendarmettes” (Yo Macumba). For the anecdote Nicaise was born in the French Caribbean island Guadeloupe and she has Indian ancestors as her grandmother was from Pondicherry. RED HALO is a collection of household linen based in Benaras (Varanasi – India) providing work to people living with difficulties and education to children. 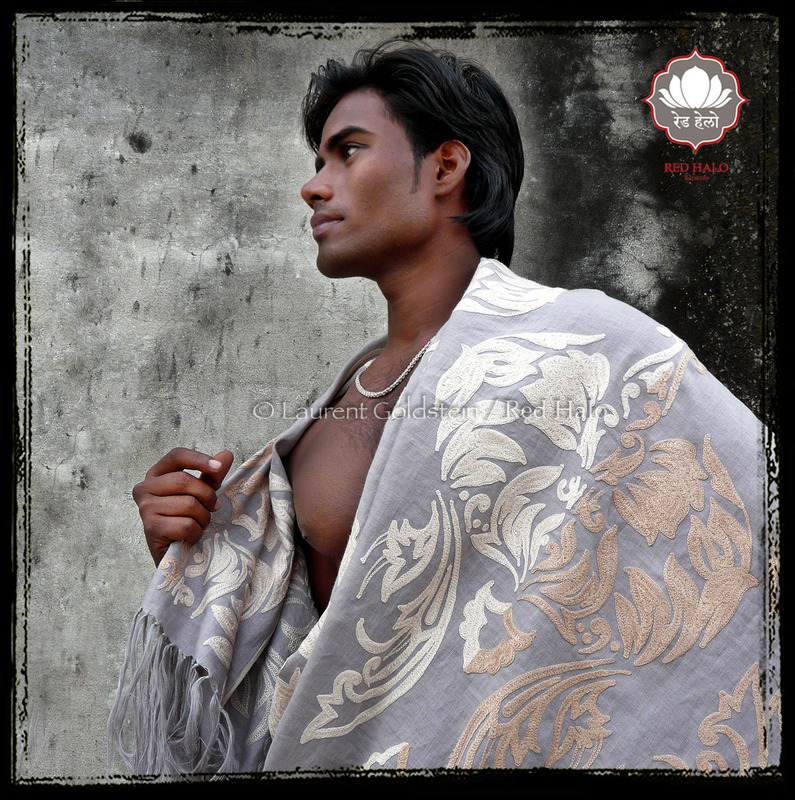 Anand is wrapped in a throw made of pure linen with a aari embroidery. (Helen Thompson – American writer)Nicaise is wrapped in a woolen throw with Aari embroideries showing Rajasthani horses. (Throw style “Raj” – Col. Walnut – 200×150 – 100% Wool – Collection RED HALO)The iconic French actress and model Nicaise Jean-Louis has kindly accepted to pose for Red Halo in order to support our social work. During the 70’s Nicaise became one of the first top models with dark skin complexion to work for High Fashion companies, ever since she never stopped working for the most prestigious fashion names, she also performed on stage and played is several iconic movies such as “Moonraker” (a Bond girl) or the well known French movie “Le gendarme et les gendarmettes” (Yo Macumba).